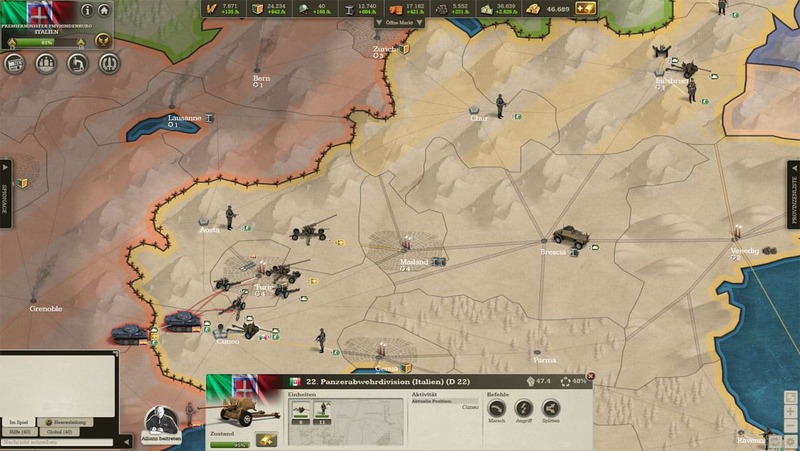 Lead your nation in the F2P browser strategy game Call of War by the turmoil of the Second World War and the beginning of the Atomic Age and the Cold War. Start of a game Call of War as leader of the American Southern States. 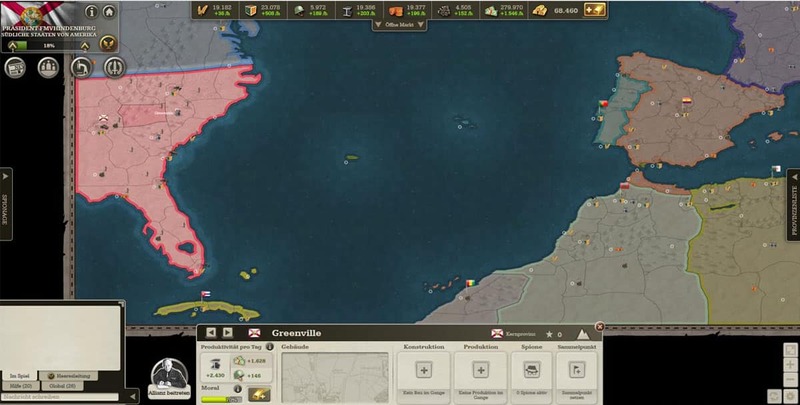 In a standard game of the free browser strategy game Call of War (superficially similar as in the already presented Supremacy 1914 in the time of World War One) you have to lead your nation through the age of WW2 and the beginning cold war with Nuclear weapons and missiles. However, Call of War comes with some innovations, changes and more appealing graphics – and the management of the armed forces, the economy and the battles in real-time is clearer and with less effort for the player compared to Supremacy 1914. 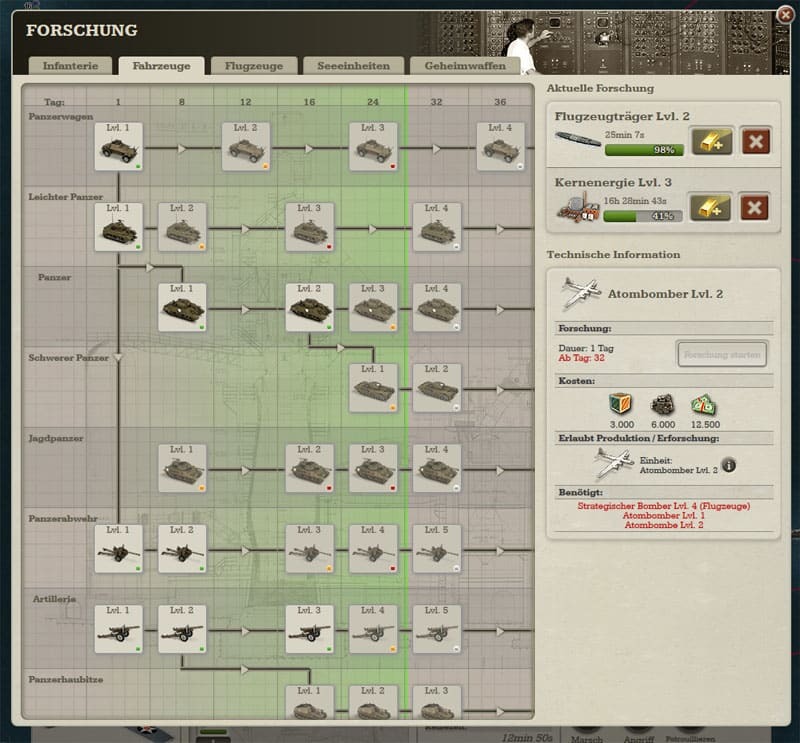 There are much more different units which can be improved and researched. The game map stretches from the eastern part of North America (Canada to Cuba) to the Middle East, and from Greenland and the North Cape to the South to the North African desert. The countries do not always correspond to the historical situation and have been adapted so that they are roughly equal. Some great powers (such as the US and the Soviet Union) were divided into several states, while some smaller states were united into a major (such as ‘Greater Romania’ in the Balkans). All 22 players begin with 20 so-called ‘core provinces’. Core provinces are provinces with a national population and produce money, labor and recruits and some of them raw materials for 100% while other provinces are considered ‘occupied areas’ and produce a maximum of 25% of them. Majority from the western part of the game map of Call of War until Central Europe from Call of War (later during the game on day 29). 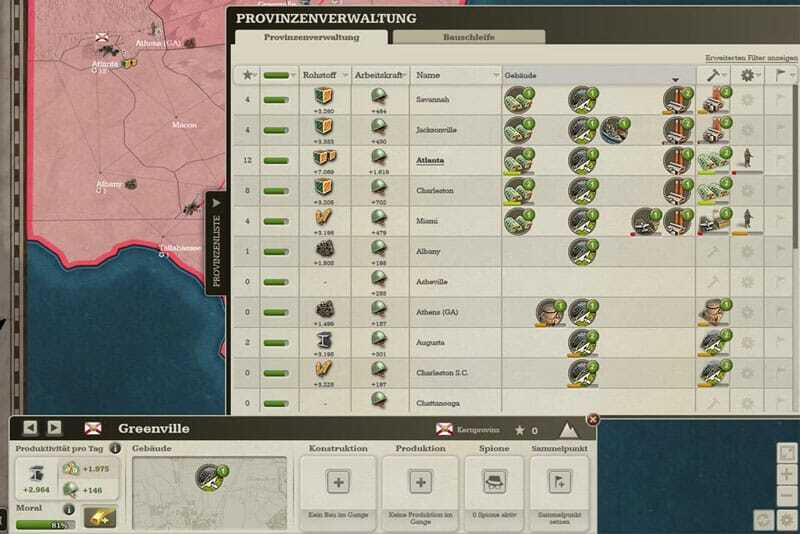 At this point, the optimization and simplification of the game Call of War versus Supremacy 1914 begins: while the player in Supremacy 1914 later must constantly monitor and expand countless provinces, it is enough in Call of War to concentrate on the core provinces, while the expansion of the other provinces is only economically worthwhile in the rarest cases. Also, these ‘core provinces’ are also areas whose defense is vital. All other provinces are only needed for minor additions of missing raw materials, as bases for harbors and airfields and essentially for the collection of the required victory points to win the game. By the way, each province now has a certain terrain (flatlands, mountains, forests, cities), which has different influence on the speed and combat performance of the different units. The research menu in Call of War. Here are some of the land units. In Call of War there are also different units than in Supremacy 1914, which must be researched and further developed. Since this is not possible for all of them (only two researches can be carried out at the same time), one has to concentrate on the focus. In addition to infantry, there is militia, motorized infantry and mechanized infantry (in APC’s). In the category vehicles there are armored vehicles, light tanks, medium tanks, heavy tanks, anti-tank guns, artillery, self-propelled artillery, anti-aircraft guns and self-propelled anti-aircraft guns. As aircrafts there are interceptors, tactical bombers, strategic bombers and naval bombers. In the case of the naval units there are destroyers, submarines, cruisers, battleships and aircraft carriers. Finally, in the case of secret weapons, there are rockets, rocket fighters, railway long-range artillery, commando units, nuclear power, atomic bombs, atomic bombers, atomic rockets and nuclear-powered battleships, submarines and aircraft carriers. All are identical for all nations and equally deployable. Here you can see Italian units fighting Spanish invaders in Northern Italy. In this range, Call of War is much more complex than Supremacy 1914, as a predictive development of the most likely units is unavoidable. There is also a ‘scissors-stone-paper’ principle, so that certain units are very useful when the opponent is mainly specialized in a particular unit type. For example, good anti-tank guns, especially in suitable terrain or with deployed positions, has a strong influence on attacking, hostile armoured units and is also more economical, but little suited for the attack. Commando units are best suited for defense and attack in the mountains, while medium tanks are the best unit of attack for land warfare, as long as you do not have to fight in cities and encounter protected anti-tank gun positions. Tactical bombers can smash ground units without air cover by fighters or anti-aircraft guns, while naval bombers can discover and fight submarines as well as enemy submarines. After all, there are still atomic bombs to explore, which can put whole cities in ruins. As an alternative, there are also cruise missiles (V-1) and rockets (V-2), which finally culminate in an atomic rocket which can not be catched by fighters. As mentioned above, the provincial development is also easier and clearer than in the case of Supremacy 1914. The provincial administration menu, which can be folded out on the right, clearly shows the respective victory points, morality, raw materials (including production volume), workers, buildings (sorted and activated or deactivated), construction of new building and units. This table can be arbitrarily sorted and since only the own core provinces (plus some possibly occupied provinces with double production volumes or important bases, fortifications or production areas close to the frontline) are important, everything can be easily overview and controlled here. The menu for Atlanta, the capital of the Southern States of America. 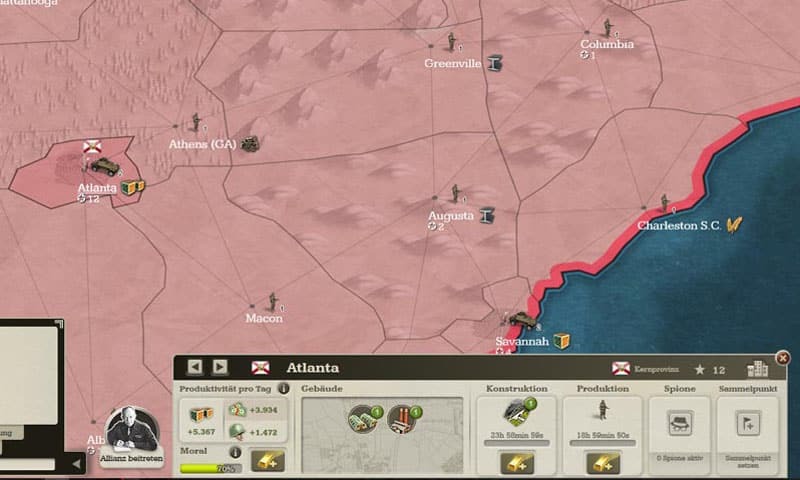 In addition, each provincial city can also be clicked on the map, where buildings, production units or orders for spies can be determined or checked. In Call of War, an official coalition can be formed. This includes a revealed map for the members, who can see all the enlightenment results and units of their allies, can march across friendly territory and fight together. 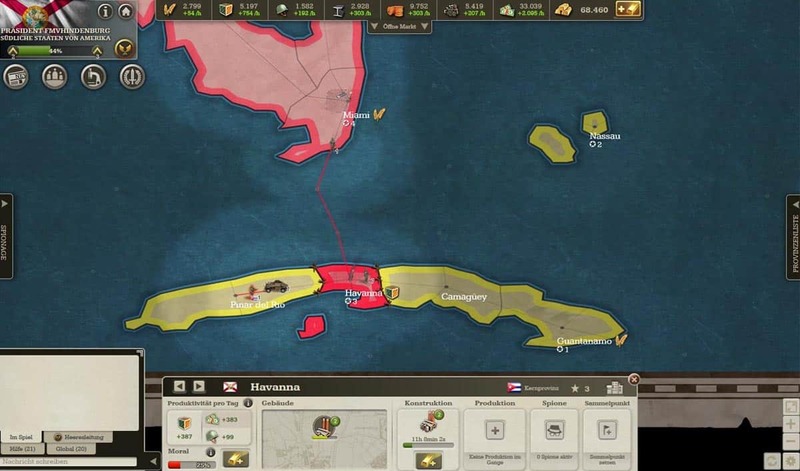 On Day 3, Southern American troops landed on Cuba (a small country led by the AI) and began the conquest of the island the next day. It is also of particular importance to observe its neighbors attentively. On the one hand, to grab opportunities when players do not lead their nation adequately or give up completely. The majority of the 22 players of a game actually give up quick or do not really get into the game, but the remaining players usually struggle all the more stubbornly for the victory in an exciting game. The nations of left players are led by a relatively strong AI, as are the numerous small states that are initially present – but which are mostly the first prey of the more active players. Call of War also runs all day in real-time, so you should log in at regular intervals to review your current status and location of units, and issue new orders to your units, provinces, and factories. Basically, the real-time strategy game is free, but there is an ‘in-game’ Gold currency that allows players who can not log in so often to compensate for these disadvantages by accelerating construction or research or increasing morale. 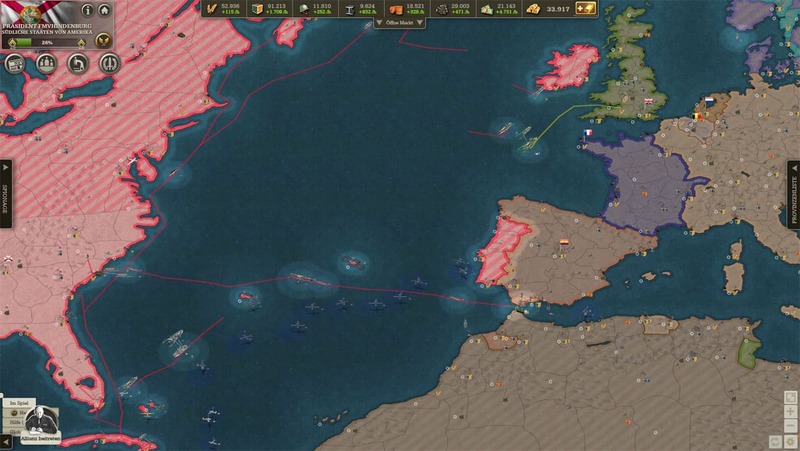 At Call of War there are six different scenarios from four to 100 players on the maps of Europe (including the Northern Atlantic and North America), the Mediterranean, a World War and the Pacific. It is also possible to play private games with friends or selected players.